This stunning Indonesian island is on everyone’s bucket list right now, but are you really surprised? The weather is exactly what you’d expect on a tropical island 8 degrees south of the Equator, so be prepared for a hot (30C+) and humid stay. Dramatic glimpses of the volcanic landscape peep through the rain forest canopy, which carpets the island right down to white, sandy beaches, and coral reefs teeming with turtles and manta rays. Back on land is home to hundreds of species of rare tropical birds, leopard cats, and macaques. Fresh, tropical fruits are abundant and stunning smoothie bowls are easy to come by, along with your morning kopi (coffee). Leave a lasting impression on the Balinese locals by wishing them Om swastiastu, a local greeting that translates as peace and goodness from God. 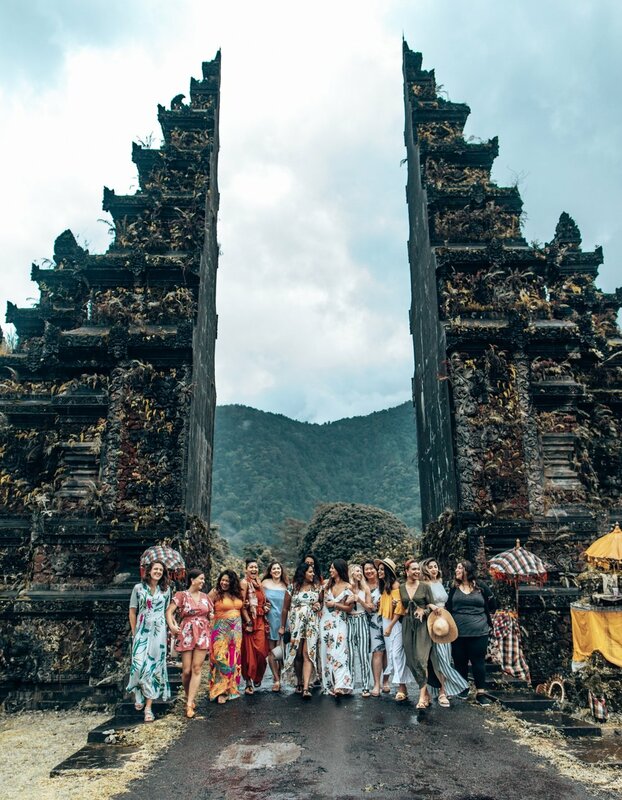 Bali is the ULTIMATE bucket list destination for every girl. Lucky for you we are taking The Girls Trip back to one of the most breathtaking islands in the world. Join us as we explore the Balinese culture and visit some of the most beautiful sights on the island. We're talking about temples, waterfalls, food, and most of all, the people who make this island so beautiful. We will be taking you through an experience you will remember for a lifetime. On this trip we want to show you all the beauty and culture Bali has to offer. We have multiple excursions and experiences planned, all carefully curated just for our tribe. Please note the below itinerary is a sample and subject to change. DAY 1 - All guests will arrive at our gorgeous villa through private transportation. While we wait for everyone to arrive, we will spend the day by the pool, lunching and getting to know each other. Once all the girls have arrived, we will host a Meet & Greet and head out for an all white welcome dinner. DAY 2 - We will start the day off with a delicious breakfast at the villa followed by a TGT circle to set our intentions. After that we will head up north to visit the famous Bali swing sets, Beratan Lake Temple followed by a quick pit stop at the Instagram famous Handara Gate for some pictures. Then it’s back to the villa for some relaxation and down time before heading out for dinner. DAY 3 - Rise and Shine! We will start our day early, so be ready to EXPLORE because the day will consist of visits to Bali’s most famous attractions; including waterfalls, rice terraces, and temples. We will also lunch in between - think eat, pray, love. After our full adventurous day, we will head back to the villa for some downtime and dinner. DAY 4 - This will be a relaxed day, breakfast will be served at the villa followed by some downtime. For lunch, we will go to one of our favourite cafe’s in Seminyak with a pit stop at the iconic Kynd Cafe for some ice cream. We will then head to one of Bali’s best beach clubs for sunset views and dinner. For those wanting a night out, we will take you dancing at one of Bali’s hottest nightclubs. DAY 5 - We will start our day off with breakfast at the villa and then off to Ubud for a full day of activities. First will be a visit to the Monkey Forest. This sanctuary is home to hundreds of Balinese long tailed monkeys. After meeting our furry little friends we will stop off at the traditional art market for shopping and lunch. After we have indulged in some food, its time for pampering! We will spoil you by taking you for a 1-hour body massage and flower bath. Before heading back to the villa, you can expect a delicious dinner. DAY 6 - This day we will be offering two activities that you ladies will get to choose between, depending on how you are feeling. Group 1 will be heading for a day trip to the island of Nusa Penida, which will be a full 12-hour day from 6am to 6pm. Group 2 will have free time and then head to the beach for sunset. We will all regroup for dinner! DAY 7 - On this day we will start off with a special breakfast circle to reflect on our trip so far. You will have the day to yourself to do a bit more exploring, shop, or get some more spa time in before leaving! In the late evening, we will head to Uluwatu for a traditional Balinese dance ceremony followed by dinner. DAY 8 - Sadly, it’s time to say goodbye. We will have breakfast and then head to the airport via our private transportation. We promise you will leave this trip with lasting memories, incredible photos, and a new community of women to lean on! Fill out the form below if you are interested in tripping with us to Bali! You will hear back from our team within 48 hours after we receive your registration form below.